The Bibliothèque nationale de France (BnF) is the National Library of France, located in Paris. It is intended to be the repository of all that is published in France. The Library was originated from the royal library by Charles V in 1368, opened to the public in 1692, and became the first free public library in the world in 1793. The Library holds over ten million books, three hundred fifty thousands manuscripts as well as a large number of maps, coins, and others. All works published in France are deposited to the Library by law established in 1537. The Library also maintains Gallica, a digital library established in 1997. France is known for its cultural contributions to the world. In 1980s, François Mitterrand, twenty first President of France, initiated a national cultural project which included a renewal of the Library, renovation of Musée du Louvre, and construction of L’Opéra de la Bastille. The construction of a new library building was completed in 1994. The Library is one of the best libraries for medieval, modern, and contemporary European literature in the world. The National Library of France traces its origin to the royal library founded at the Louvre by Charles V in 1368. It expanded under Louis XIV and became open to the public in 1692. The library's collections swelled to over 300,000 volumes during the radical phase of the French Revolution when the private libraries of aristocrats and clergy were seized. By an act of the revolutionary French National Convention, the Library became the first free public library in the world in 1793. Following the series of regime changes in France, it became the Imperial National Library and in 1868 was moved to newly constructed buildings on the rue de Richelieu designed by Henri Labrouste. On July 14, 1988, President François Mitterrand announced the construction and the expansion of one of the largest and most modern libraries in the world, intended to cover all fields of knowledge, and designed to be accessible to all. Using the most modern data transfer technologies, which could be consulted from a distance, and which would collaborate with other European libraries. In July 1989, the services of the architectural firm of Dominique Perrault were retained. The construction was carried out by Bouygues. After the move of the major collections from the rue de Richelieu, the National Library of France opened to the public on December 20, 1996. It contains more than ten million volumes. The library retains the use of the rue de Richelieu complex for some of its collections. Four tall buildings of the Bibliothèque Nationale de France, seen from the right bank of the Seine river. On the left side, the Simone-de-Beauvoir footbridge and on the right side the Bercy bridge. François Mitterrand site, East entrance/exit. The National Library of France is a public establishment under the supervision of the Ministry of Culture. Its mission is to constitute collections, especially the copies of works published in France that must, by law, be deposited, conserved on site, and made available to the public. It produces a reference catalog, cooperates with other national and international establishments, and participates in research programs. The library holds about 5,000 Greek manuscripts, which are divided into three fonds: Fonds grec, fonds Coislin, and supplément grec. In 1997, the digital library was established for online users. As of April 2006, Gallica was made available on the Web: 90,000 scanned volumes, 1,200 full-text volumes, 500 audio documents, and 80,000 images. The Bibliothèque de l'Arsenal (Library of the Arsenal) in Paris is one of the branches of the Bibliothèque nationale de France. The collections of the library originated with the private library of Marc-René, 3rd marquis d'Argenson (1722–1787), installed in 1757 in the residence of the Grand Master of the Artillery, at the heart of the ancient Arsenal of Paris. The Arsenal itself was founded by King François I in the sixteenth century, later rebuilt by Sully, and expanded by the architect Gabriel Germain Boffrand in the eighteenth century. Paulmy had assembled a magnificent collection, particularly rich in medieval manuscripts and prints. In 1786, he also acquired the collection of the duc de la Vallière, but then sold the entire library to the comte d'Artois. The library was sequestered by the state during the French Revolution, and was greatly expanded by many valuable items seized from the abbeys of Paris and also by the archives of the Bastille. On April 28, 1797, it was declared a public library. In 1824, the writer Charles Nodier became librarian and held in the Arsenal some of the most reputable literary salons of the day. In the 19th century the collections became increasingly focused towards literature, especially drama. Between 1880 and 1914 the library acquired a copy of every periodical published in Paris. In 1934 it became a department of the Bibliothèque nationale. The library today holds approximately one million volumes (including 150,000 pre-1880 volumes), just over 12,000 manuscripts, 100,000 prints, and 3,000 charts and plans. Its collecting policy concentrates on French literature from the sixteenth century to the nineteenth century, publications connected with the archives and manuscript collections (fonds) already held, bibliophilia, the history of the book and bookbinding, and the history of the Arsenal itself and its occupants. Archives of the Bastille: The archives of the Bastille date from 1660 onwards. They comprise prisoner dossiers (including those of the marquis de Sade and other famous prisoners), the archives of the Lieutenancy of Police of Paris, the Chambre de l'Arsenal and the Chambre du Châtelet, private papers of the officers of the Bastille, and a portion of the papers of the Royal Family. Fonds Prosper Enfantin: Paul-Mathieu Laurent, known as Laurent de l'Ardèche, was a disciple of the Saint-Simonist Prosper Enfantin and librarian of the Arsenal. In 1865, he acquired the papers of Enfantin, which are a rich source for the history of Saint-Simonism. Fonds Lambert: In 1969, Pierre Lambert, a bookseller who had devoted his life to collecting items connected with the writer Joris-Karl Huysmans, bequeathed his collection to the library. It includes manuscripts, letters, works that belonged to Huysmans, and original editions of his works. Louis-Sébastien Mercier Papers: In 1967, the library acquired the papers of Louis-Sebastien Mercier (1740–1814), who had had a great influence on the evolution of the theatre and in particular on realistic drama. He is particularly known for his descriptions of Paris. The collection contains biographical documents and correspondence, articles, notes, the manuscripts of Nouveau Paris and his plays and works of poetry and philosophy. Fonds Lacroix: Paul Lacroix, known as Bibliophile Jacob, worked at the Arsenal for several years. After his death in 1884, the library acquired most of his personal papers, including his collection of autographs, contained in letters from writers, musicians and philosophers, both contemporary with Lacroix and older. Fonds Péladan: In 1936, the Arsenal acquired all the papers of Joséphin Péladan (1858–1918), a spiritualist writer who was fascinated by the occult and in 1891 founded his own church. José-Maria de Heredia Collection: The daughters of the poet José María de Heredia, who was librarian of the Arsenal from 1901 until his death in 1905, gave the library a collection of portraits, manuscripts, works and letters concerning their father and themselves. One of them, Marie de Régnier (whose pen name was Gerard d'Houville), bequeathed her library to the Arsenal. The library is also very rich in items connected with the writer Pierre Louÿs, Heredia's son-in-law. Fonds Georges Douay: Georges Douay, Parisian man-about-town, theatre fan, and composer of songs and operettas, assembled a collection (mainly printed) on French theatre from the sixteenth century to the beginning of the twentieth century, which he bequeathed to the Arsenal in 1919. Archives Parlementaires: The official, printed record of the French National Assembly from the 1789 Revolution forward. Prints: The print collection comprises portraits, many caricatures of the Revolution and the Restoration, a topographic series of plans and views of cities, and major series of the 18th century Italian, German and English schools bought by Paulmy during his travels throughout Europe. Charts and Plans: Paulmy acquired a magnificent series of military reconnaissance plans that had been made for his uncle, the comte d'Argenson, who was Minister of War. Music: The Arsenal's collection of manuscript and printed music almost exclusively comes from the eighteenth century, except for a few medieval manuscripts. Most of the music collection was assembled by Paulmy. The library is also rich in occult documents. These include the original manuscripts of The Sacred Magic of Abra-Melin and the Book of the Penitence of Adam. The Cabinet des Médailles, or Cabinet de France, more formally known as Le département des Monnaies, Médailles et Antiquités de la Bibliothèque Nationale, is a department of the Bibliothèque nationale de France in Paris, housed in its former premises in rue de Richelieu. 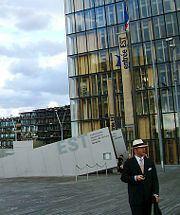 The Bibliothèque Nationale has new premises in the Tolbiac district, Paris 13e. The Cabinet des Médailles is a museum presenting numerous coin collections and antiquities, with its distant origins in the treasuries of the French kings of the Middle Ages. The disruptions of the Wars of Religion inspired Charles IX to create the position of a garde particulier des médailles et antiques du roi a "guardian entrusted specifically with the medals and ancient coins and antiquities of the Crown." Thus the collection, which has been augmented and never again dispersed (the first royal library, assembled at the Palais du Louvre by Charles V, which contained 973 volumes when it was inventoried in 1373, was dispersed during the following century), passed from being the personal collection of the king to becoming a national property—a bien national—as the royal collection was declared during the Revolution. A stage in this aspect of its development was the bequest of the collection of pioneering archeologist comte de Caylus, who knew that in this fashion his antiquities would be most accessible to scholars. 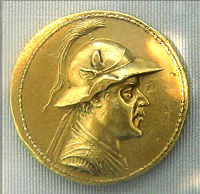 Other collectors followed suit: when the duc de Luynes gave his collection of Greek coins to the Cabinet Impérial in 1862, it was a national collection rather than simply an Imperial one he was enriching. The State also added to the treasury contained in the Cabinet des Médailles: A notable addition, in 1846, was the early sixth century gold Treasure of Gourdon. The Cabinet—a term which in French implies a small private room for the conservation and display of intimate works of art and for private conversations, rather than a piece of furniture— took a stable shape under Henri IV, who nominated connoisseur Rascas de Bagarris garde particulier des médailles et antiques du roi, the "particular guardian of the medals and antiquities of the King." The Sassanian "Cup of Chosroes," from Saint-Denis, where it was treasured as "King Solomon's Cup"
Earlier printed catalogs of parts of the collection had been published. Pierre-Jean Mariette, urged by the comte de Caylus, published a selection of the royal carved hardstones as volume II of his Traité des pierres gravées (Paris, 1750). Louis XIV of France, an acquisitive connoisseur, brought together the cabinet de curiosités of his uncle Gaston d'Orléans and acquired that of Hippolyte de Béthune, the nephew of Henri IV's minister Sully. In order to keep the collections closer at hand, he removed them from the old royal library in Paris to Versailles. When Louis' great-grandson Louis XV had attained majority, the Cabinet was returned to Paris in 1724, to take up its present space in the royal library that was designed under the direction of Jules-Robert de Cotte, the son of Mansart's successor at the Bâtiments du Roi. In the Cabinet des Médailles, the medal-cabinet delivered in 1739 by the ébéniste du roi Antoine Gaudreau figures among the greatest pieces of French furniture. Other medal cabinets were delivered for Louis XIV by André-Charles Boulle. The cabinet also still houses its paintings by Boucher, Natoire, and Van Loo. The Cabinet des Médailles is considered the oldest museum in France. It is located in the former building of the Bibliothèque Nationale, 58 rue Richelieu, Paris I, and can be visited for free every afternoon (13:00-17:00), seven days a week. ↑ BnF, La BnF en chiffres. Retrieved December 9, 2008. ↑ Théophile Marion Dumersan, Histoire de Cabinet des Médailles, antiques et pierres gravées, avec une notice sur la Bibliothèque Royale et une description des objets exposés dans cet établissement (Paris: chez l'auteur, 1838). Dh̐ưerent, Catherine. 2006. "Document Management at the French National Library." Records Management Journal. 16 (2): 97-101. DOM Multimedia. Books and Kings. Discovery of Art. West Long Branch, NJ: Kultur, 1999. Favier, Jean. 1996. "The History of the French National Library." Daedalus: Proceedings of the American Academy of Arts and Sciences. 125 (4): 283. Hinshaw, M. 2005. "Incarcerated Landscape The French National Library Is As Austere and Off-Putting As Any Work of Civic Design Could Possibly Be." Landscape Architecture. 95 (3): 166-168. Jackson, W. V. 1999. "The French National Library: A Special Report." World Libraries. 9: 3-30. Netzer, M. 2007. "The Leadership and Management Development Programme in the French National Library." IFLA Publications. 126: 100-105. Renoult, D.1996. "Digitisation and Preservation in the French National Library." European Libraries Cooperation. 6 (4): 465-471. Riding, Alan. "France Detects a Cultural Threat in Google." New York Times. April 11, 2005. Retrieved December 9, 2008. Smith, Jeanne. 1995. "The French Collection: Treasures from the Bibliotèque Nationale to Go on View." Library of Congress Information Bulletin. 54 (15): 334-347. History of "Bibliothèque nationale de France"
This page was last modified on 7 June 2016, at 16:06.